The McCormick Tribune Campus Center (MTCC) at 33rd and State Streets opened in September 2003. Designed by Dutch architect Rem Koolhaas, he was chosen for the project as a result of an international design competition held in 1997-98. Among his completed buildings are the Lille Grand Palais and the Maison a Bordeaux in France, the Netherlands Dance Center in The Hague, and the Educatorium at the University of Utrecht, the Netherlands. Koolhaas' design for the campus center arranges various areas around diagonal pathways, resembling interior streets, that are extensions of the paths students use to cross the campus. 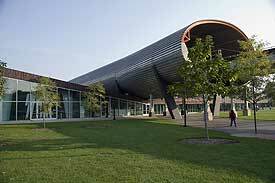 The design includes a concrete and stainless steel tube that encloses a 530-foot stretch of the Chicago Transit Authority's elevated Green Line commuter rail ("L") tracks, passing directly over the one-story campus center building. The tube dampens the sound of trains overhead as students enjoy food courts, student organization offices, retail shops, a recreational facility and campus events. MTCC has meeting, multipurpose and dining spaces that fit a variety of event types and sizes. For reservation information contact the Office of Event Services.